Guerrilla gardening has taken off around the globe – and it’s not as subversive as it sounds. It has many applications, though it particularly refers to the enforced cultivation of public or private land that would otherwise lie fallow, by concerned, green fingered citizens. There are many international schemes to further the aims of guerrilla gardeners. 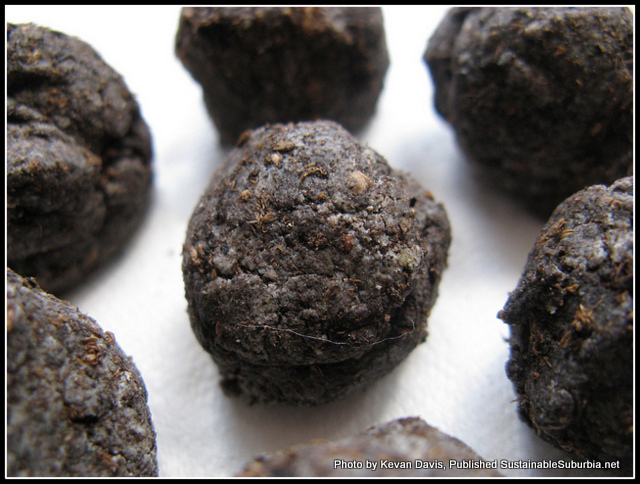 One of the more novel applications is the distribution of clay based seed balls for public dispersal onto unused land. Otherwise known as seed bombs, these are dispensed from converted vintage gum ball machines, in a happy marriage of recycling and public land cultivation. Guerrilla gardeners are active, and they are influencing the powers that be. According to Wikipedia, guerrilla gardening is ‘gardening on land that the gardeners do not have a legal right to use, often an abandoned site or area not cared for by anyone. That land is used by guerrilla gardeners to raise plants’. Generally this refers to food crops, or plants that will ‘beautify an area’. 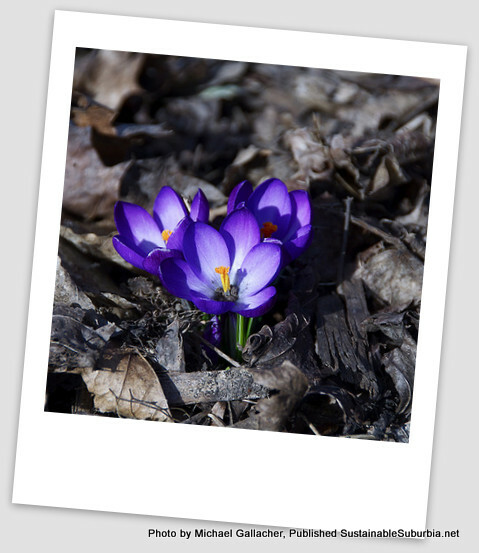 In 2009, masses of bulbs were planted in Glasgow by guerrilla gardeners, among them these gorgeous crocuses. Photo by guerilla gardener, Michael Gallacher. Either at night under cover of darkness, or more blatantly during the day in order to be seen by the local community, guerrilla gardeners are planting. They meet and plan a campaign to ensure growth in places normally untouched. Often these places are visible to everyone – on traffic roundabouts, by the sides of roads, or just in neglected public sites that present the possibility for cultivation. Social networking on the internet is a convenient arena which allows guerrilla gardeners to meet up, suggest areas for planting and organise their activities, and guerrillagardening.org is an international virtual forum and meeting place for guerrilla gardeners everywhere. So where has this green revolution come from? With followers documented in over thirty countries around the world, the phrase was first coined in 1973 in New York by Liz Christy, and the Green Guerrilla group. They turned a derelict plot of private land in the Bowery Houston area into a garden, which is now part of the New York parks department, cared for by volunteers. Around the same time, renowned local character Adam Purple tended an abandoned lot in the lower East side of Manhattan, creating a circular garden in a yin yang shape. The story was told in the film ‘Adam Purple and the Garden of Eden’. I was born and brought up in Manchester, England and we aren’t just about rival football teams, or ‘Madchester’ music, or even the famously high rainfall! A growing group of, if not quite green revolutionaries, then certainly people who care about their environment have been stirred to action. They believe it is just not right for areas of land, often publically owned, to stay fallow and, uncared for. Manchester City Council has sniffed the breeze, taken account of the global economic down turn, and planted fruit trees in public parks – with a statement that the fruit is available to the public. Plum trees, apple trees – hitherto it has been the case that public property, including flowers and fruit in British municipal parks, is sacrosanct and not usually available to be picked by whoever turns up. According to the council’s parks and leisure boss, the plan is for every Mancunian to be within walking distance of a fruit or veg patch. Leaf Street is an acre of land in Hulme, Manchester (where I was born, incidentally!) which was turfed over by Manchester City Council, though formerly it was an urban street. It has now been spontaneously turned into a community garden by local Mancunians ( citizens of Manchester). Australian gardener Bob Crombie has coined the term ‘Bewildering’, and its ethos is very similar to that of worldwide guerrilla gardeners. According to Crombie, ‘Bewilder’ is an old term meaning ‘to become connected to life, the source, the spirit, God, Nature through being wholeheartedly in nature’ and essentially ‘charmed by Nature’. He goes on to say that part of the way of the ‘Bewilderer’ is to create wide wild median strips along roads and to create roadside features, planters and tree bays. 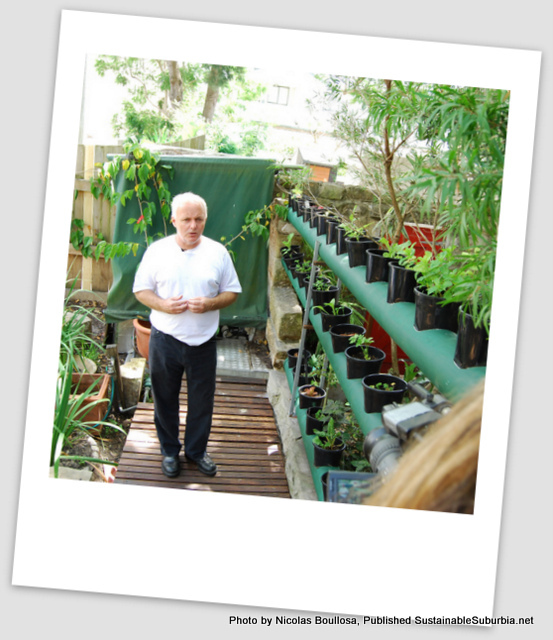 Michael Mobbs, author of Sustainable House, in his backyard in Chippendale, Sydney. Photo by Nicolas Boullosa. In 2008, Australian sustainable food growing pioneer Michael Mobbs created a “road garden” in his Chippendale street in Sydney. The public garden gained massive residential support, which led to Sydney City Council, followed by other local councils, to change their policies and support food growing, as well as active composting in the city’s streets. In Melbourne land along railway lines has been cultivated with native plants, and most of the inner northern suburbs have vegetable gardens created by the community. Guerrilla gardeners in Melbourne tend to fall into two groups – those who are more interested in communal food growing and those most concerned with planting native species. A Network 10 show called ‘Guerrilla Gardeners’ featured a team of gardeners who cultivated council owned land, though without initial council permission. So, who organized the eco-friendly gumball machines? Based in Los Angeles and established in 2010, Greenaid is an organization that converts vintage gumball machines into seed ball dispensers. Made from compost, clay and seeds suited to the local environment, the seed ball machines are then distributed by Greenaid and their worldwide partners to communities around the globe. Seed balls are thrown onto open, unused areas of land that would benefit from wild flowers, like the sides of roads, or the centre of roundabouts . So if you want to create a green revolution, then why not throw some seed bombs on an unused piece of land near you? Top photo: Seed bombs. One part Bentonite clay powder, one part potting compost, some poppy and nasturtium seeds, and enough water to make it stick. Photo by Kevan Davis. I love this idea, and have actually had my eye on a patch of land at the end of my street. I’m tempted to get onto “Belwildering” it.